Influence on the specifics of other published games is one of the biggest factors that help game developers make choices, ideas and concepts for what they want in their our own projects. Whether they are interested in a graphical feature, game play aspect or even the designs of the characters and themes in the game, these influential aspects help them make a game with it's own unique aspects. With a combination of influence from Limbo and Trine, Subios Studio is working on Leecher - A Wander Through Perceptions. From Limbo they took the atmosphere and color blinded, black and white, graphics, while from Trine the idea of multiple characters; taking puzzle solving from both. You can also expect not to be able to take any damage as it only takes one hit and your dead. 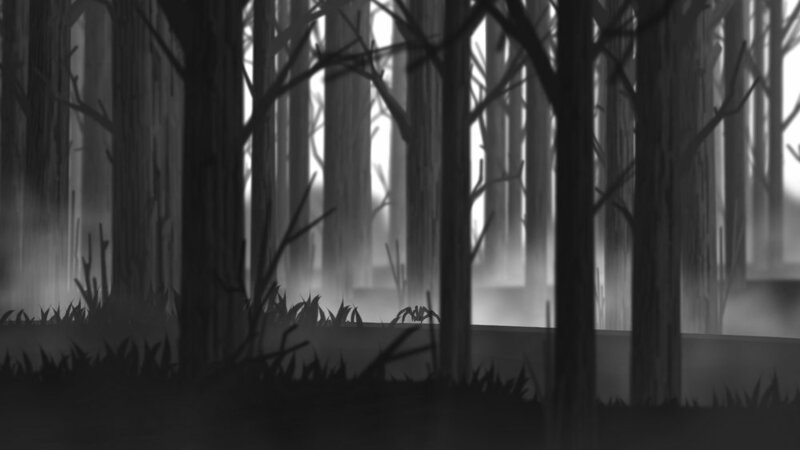 Leecher is a 2D horror/suspense sidescroller puzzle game coming to PC, Mac and Linux. The game will be six chapters, each chapter will feature a new character for you to play as. Each character will face their own puzzles and challenges, according to strengths and limitations of the character. At each stage you will have to master a new character that has its own unique mechanics and a different scheme of visual perception. Also, each chapter will be essential to the story. The action takes place in the distant future on a faraway planet. For a long time its climate remained unchanged which allowed for evolution to flourish and many bizarre creatures emerged. You are one of them - a symbiote that is able to connect to the central nervous system of other organisms. The nature around you is unstable so you have to start a long wander through the unknown places and substances in order to find a new home. The game will have a mysterious story that is not going to be told of to the player. You will have to uncover the story and create theories of what the story may be about through what you see on a humanoid civilization and some stone images, statues, and abandoned places that will tell the story of their world. The Climber - This creature is a terrestrial being that is able to jump onto ceilings and walls and climb on and up them. The game play will test your reaction and the ability to solve spatial tasks of low and medium complexity. It has a simple black and white vision with lowered level of detail. The Crowd Fish - An aquatic being. The mechanics of this character are based on the interaction with the fish shoal. You will have to be very observant and watch the behavior of other fish to know when the shoal is ready to follow your actions and when it is frightened. By ignoring its state and sacrificing your comrades in vain, you will significantly complicate advancing to further levels. It has a full color vision with the emphasis on the shoal insight and with a distortion of the above-water space. The Bat - This character is violent and belongs to the most dynamic part of the game. You will struggle with gravity and hunt on various fauna specimen . This creature has a high contrast vision with low depth of field and a threats color differentiation. The Cow - A terrestrial being that can walk, lie down, and chew. Primarily, it is needed for a slight relaxation. Its vision has saturated colors with a tilted balance. The Colony Master - A subterranean being that can’t move by itself, but has an ability to control a colony of giant insects. Various classes of units will be at your disposal. It would be up to you to decide which units to raise, how to defend and what to conquer. This character will add real-time strategy elements of “rock-paper-scissors” classical type. This characters display area will have a “friend-foe” color identification and a fuzzy projection of orders and actions. The Spider - A terrestrial being. Its gaming stage will contain the highest number of puzzles. The mechanics feature the ability to use the web to move, interact with objects and create complex spatial constructions. The creature is able to see low-frequency radiation. The challenges that each character faces will be unique and can vary from a few different types. There could be an object in the way, an environmental event (like maelstorm or an earthquake) that can cause environmental destruction, an enemy creature to face or a combination of any two, if not all three. Here is a simple scene to give you an example. Your playing as The Climber and he can jump on ceilings and walls. You descend into the cave and see some bones and skulls that are gathered in heaps. Obviously, it is not safe here. You are on the ground and begin to walk forward, but an earthquake starts. You are unable to stay yourself, climb or jump on ceilings while it happens, but the exit from the cave is via the ceiling. Suddenly a creature that is three times bigger than you comes out from a small crevice in the ground and freezes. Now you have to make a fast decision: run or don't move. After you make the right choice, it is time to quickly make your way out of the cave. Here's A ZERO SUIT SAMUS Design You Can Purchase For Your Own Cosplay!